We have mentioned a mailing list several times so far, and it is time to dive into this topic. Although you probably know what a mailing list is, there are many things to know about it that could help your campaign. A mailing list is a list of people who subscribe to get the email updates about a particular website or blog. Email addresses can also be gathered through lead pages, on events, seminars, etc. You can even collect emails in stores. However, the main thing is that these email addresses are acquired in good faith, with the idea that the users provide their address willingly. There are general guidelines to follow when collecting emails. It is in your company’s interest to make sure you follow these guidelines to create a list from which your company will benefit. You do not want to end up being an uninvited guest in someone’s inbox. This way you are at great risk of being marked as spam. Always make sure the subscribers grant you a permission to contact them. Finding out more about your subscribers is going to help with list segmentation and increased level of personalization, and ultimately this produces a better outcome of the email marketing campaign. You can get to know your subscribers by providing a form for them to fill in, where you can ask for additional information. The most important fields should be mandatory, while you can also offer a couple of optional fields. Make sure you keep your subscribers updated regularly. The relationship with them is nurtured through. You could consider this as a sort of a digital spring cleaning. Get rid of all the contacts you do not need, to reduce wasting your time, to minimize the bounce rate and increase open rate of the email campaign. The success of your email campaign depends on your mailing list and how well it is gathered. Besides the practices that help with getting the most out of it, there is a need to highlight the list of things you should avoid as these can seriously jeopardize your email marketing campaign and diminish any success you were supposed to achieve. Additionally, these practices can even have a negative effect on all the subsequent email marketing campaigns. On one hand we have a self-generated mailing list which is diligently updated, and on the other hand, we have ready-made mailing lists, which one can get without much effort. However, this is considered as one of the practices to avoid, as it will only cause you harm in the long run. When you buy a list, you do not have a permission to send emails to these contact, which is a good enough reason for people to mark your email as spam without even considering it. And the more your emails are marked as spam, the more of them will end up in the spam folder automatically in the future. The second reason why this practice is not recommended is the fact that you can never be sure if this is really the list of contacts that could be interested in your business. Although it sounds cool to get instant access to a database of 20 thousand subscribers, you will see no good from it if those are the users who are not interested in your business and thus not your target group. This could also lead to a huge unsubscribe rate and spam reports, which is no way to gain credibility as a sender. When you send an email, there is a certain amount of them that will not be delivered, and those are emails that bounce. A bounce rate directly reflects the quality of your mailing lists. High bounce rate means that your mailing list needs serious updating. This is a temporary delivery failure. In this case, the email address of the recipient is recognized, but the message was not delivered to the recipient’s inbox. Numerous reasons can cause a soft bounce, including a full mailbox of the recipient, the situation when receiving server is down, the message is too large, etc. Unlike a soft bounce, which is temporary, a hard bounce is a permanent delivery failure. This means that the email address is no longer valid or in use. Invalid spelling can also be causing this issue, as well as the fact that the recipient email server may have blocked delivery. In both of these cases, you need to monitor your mailing list. If you notice a hard bounce, you should remove the email address immediately from your list. If you notice a soft bounce, there is a possibility that your email will be delivered (for example, once the recipient’s inbox is emptied). Make sure you keep an eye on addresses that soft bounce. In a case of temporary failure, there will be several automatic attempts to send the email message again. If after several attempts the message is still not being delivered, this soft bounce becomes a hard bounce, meaning you need to remove this address from the mailing list. 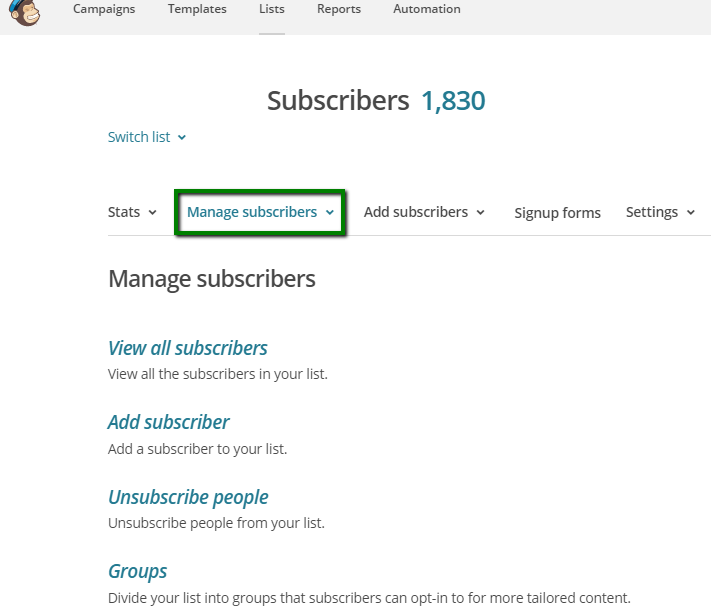 List segmentation is the process of dividing subscribers into groups. By narrowing down the list of people you target, you increase the chances of sending a relevant message and this eventually leads to better results. Email marketing tools provide list segmentation feature as a part of the tool. You will first have to import all the contacts. 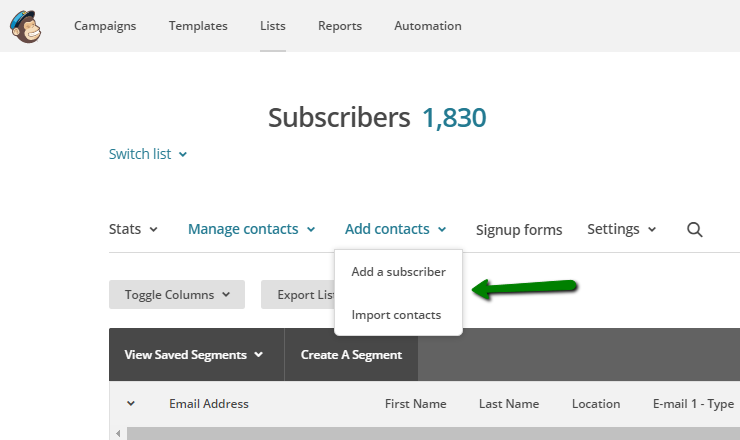 Once you import contacts, use the option to segment the list. Each of these criteria has additional options for segmentation. 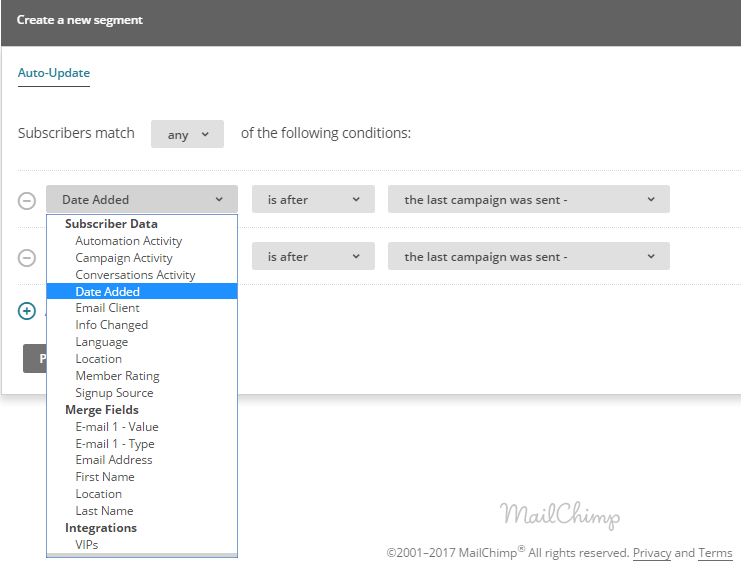 For example, if you choose campaign activity, you can segment the subscribers who have opened, click, did not open, etc. 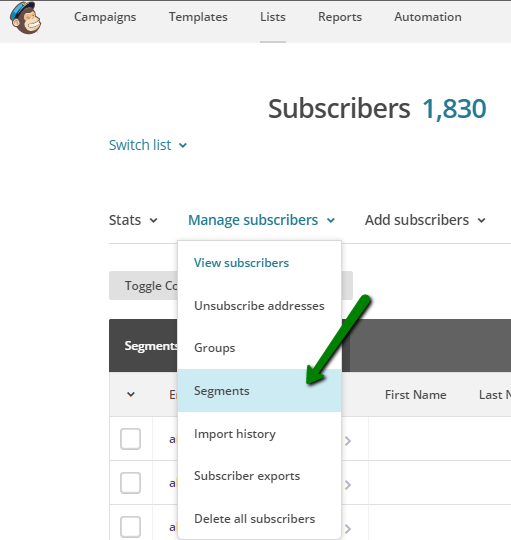 If you choose the location, you could segment subscribers who are or are not in a specific country, within a certain distance from a specific place, etc. Why is list segmentation important? Based on the numerous studies analyzing the email performance, segmented lists have higher open and click rate, with lower bounce and unsubscribe rate. These metrics directly lead to a better performance of the campaign, and they also help you build a reputation of a trusted sender. Have in mind that although all subscribers have shown interest in your business by subscribing to your newsletter, they still are not all the same. They might have different needs, they might be at different points in the sales cycle, they might live in different locations, or they speak a different language. All of these affect the kinds of emails you will be sending. When you segment email contacts, you target the emails to a specific, narrow group, and your email campaign becomes more engaging. You are able to truly address the users in a fully personalized manner, in a way they are most likely to respond, either by clicking, sharing, etc. The bottom line is – when you think about mailing list think about quality, rather than quantity. A huge number of subscribers does not necessarily mean you are doing a great job. A mailing list needs to include only those contacts that are genuinely interested in what you do, because those could become your customers in the future. To make sure you get the most out of your mailing list, take advantage of the segmentation techniques and make sure your update the list regularly.